Shiny Staroarix in game: 34 Who? Important notice! Pokemon Shiny Staroarix is a fictional character of humans. Pyroar (Japanese: ????? Kaenjishi) is a dual-type Fire/Normal Pokémon introduced in Generation VI. 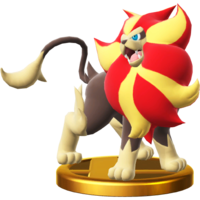 Pyroar is a quadruped, leonine Pokémon. It is mostly dark brown with light brown legs, tail tip, chest, and face. A male Pyroar has a large, dominantly red mane with gold streaks forming pattern resembling the Daimonji symbol ?. The shape also resembles the symbol for fire ?. In contrast, a female has a long, gold and red mane extending from its forehead to the whole length of its body. Pyroar's irises are tinted azure with black pupils. Pyroar live in prides, led by the male with the largest mane of fire, and the females protect the pride's cubs. Pyroar viciously threatens any challenger with a fiery breath exceeding 10,000 degrees Fahrenheit. A male Pyroar appeared in Mega Evolution Special II under the ownership of Lysandre. It reappeared in Mega Evolution Special III. Lysandre's Pyroar made its main series debut in From A to Z!. Four Pyroar appeared in A Fiery Rite of Passage!, with three of them being female and one being male. A female Pyroar appeared in Battling With a Clean Slate!, under the ownership of Alvin. A male Pyroar under the ownership of Astrid appeared in Diancie and the Cocoon of Destruction. XY097 Pyroar Ash's Pokédex Pyroar, the Royal Pokémon. 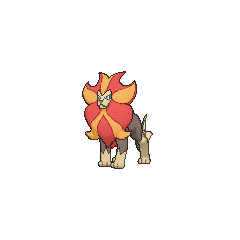 Pyroar's mane which is made of fire becomes larger when it gets excited. Lysandre's Pyroar appeared in The Beauty Eternal. It was seen accompanying Lysandre during his announcement of the Holo Caster, using Flamethrower on him to showcase its hologram functionality. It often appeared outside of its Poké Ball. 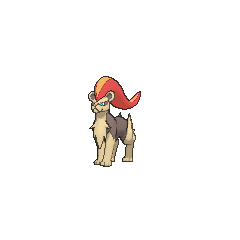 Manabu used a male Pyroar in Let's Play the Pokémon Card Game XY!. Team Flare scientist Aliana owns a female Pyroar in X-actly What They Wanted. This Pyroar is later revealed to be Malva's after she resumed to her active duty. Team Flare's Boss Lysandre owns a male Pyroar, which first appeared in Chespin Sows the Seeds of Change. A male Pyroar appears in the background of the Kalos Pokémon League stage. Pyroar appears in the Blazing Chamber along with other Fire-type Pokémon, namely Tepig, Blaziken, and Infernape. NA: The cute Litleo with a red tuft of fur evolves into the majestic-looking Pyroar. Male Pyroar have huge, fiery manes. In the wild, the male with the largest mane of fire becomes the leader. 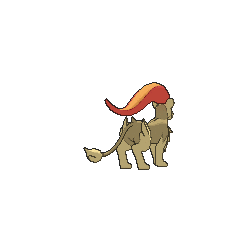 Female Pyroar have long manes and will fiercely protect the pride's cubs. PAL: Litleo, that adorable little Pokémon with a red tuft of fur, evolves into the majestic Pyroar. Males have huge fiery manes, and the one has the biggest mane is the leader of the pride. Females, on the other hand, have long, flowing manes and play the vital role of protecting the pride's cubs. Moves marked with a superscript game abbreviation can only be bred onto Pyroar in that game. 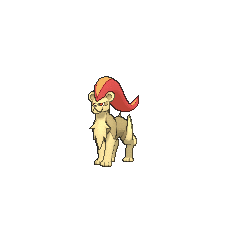 For other sprites and images, please see Pyroar images on the Bulbagarden Archives. No other Pokémon has the same type combination as Pyroar and its pre-evolution. No other Pokémon has the same gender ratio — one male to seven females — as Pyroar and its pre-evolution. Pyroar is the only Pokémon with a base stat total of 507. Pyroar shares its category with Slowking. They are both known as the Royal Pokémon. 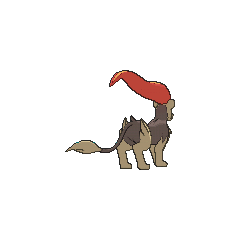 Though the male Pyroar has a chevron-shaped nose in its official artwork and in Pokémon Battle Trozei, all other merchandise, game, and anime artwork shows it with a triangular shaped nose, similar to that of the female. Pyroar is based on a lion. The style of its fur, in particular the spiked areas on its limbs and tail, more than likely is a reference to stylized lions in heraldry and coat of arms. 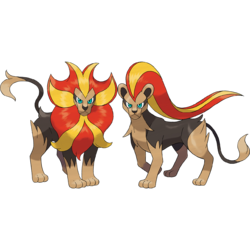 The yellow pattern on the mane of a male Pyroar is similar in shape to the Daimonji, a bonfire lit during the Japanese festival Gozan no Okuribi in the shape of the symbol ? (meaning great or large). The shape also resembles the kanji for fire (? ), as written in certain (often calligraphic) styles. Its gender ratio also resembles lions prides, which consist of one primary male lion, several females, and one or two lesser males. Pyroar may be a combination of pyr- and roar. Kaenjishi is a combination of ?? kaen (flame) and ?? shishi (lion).